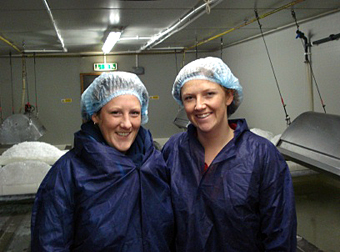 We’ve been thinking recently about how people’s connection to the land can drive their entrepreneurial spirit and there is no clearer example of this than the story of David and Alison Lea-Wilson, founders of the Anglesey Sea Salt Company. The pair have spent decades on or around the coastline of the Menai Strait, which separates the Isle of Anglesey from the rest of Wales, and have come up with a number of ideas designed to keep the family close to the sea and in the area they love so much. 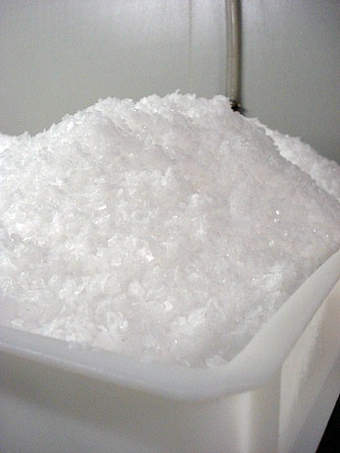 Amongst these were a fish-wholesaling business and a sea zoo, but their most recent salt-making venture is by far the most successful for the product, Halen Môn (Anglesey Salt), is now the only UK-produced salt to be certified as organic by the Soil Association and has gone from being an experiment in a saucepan on the family Aga to a kitchen staple for chefs and foodies across the world. 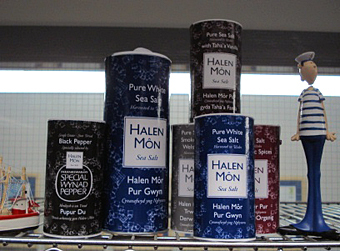 We headed down to Halen Môn HQ at Brynsiencyn to find out a bit more about it. On arrival, we were given a tour of the production room by Andy. The first thing you could say is the whole process is reassuringly hygienic! On constant ‘FB’ (foreign body) alert, anyone going anywhere near where the salt is produced must get fully kitted up. Pure Menai Strait seawater is passed through two natural filters (a mussel bed and a sandbank), before being charcoal-filtered and piped into a huge holding tank, where it is gently heated in a vacuum to speed up evaporation. Once the water reaches 15% salinity, it is transferred to shallow crystallisation tanks, where it is gently warmed from above and left overnight. By morning, large crystals will have formed at the bottom of the tanks, ready to be harvested with shovels. They are then rinsed in brine (rather than water which would dissolve them!) to remove any chalk or fine salt and give them their snowy white brilliance and it is this step that sets Halen Môn crystals aside from other UK sea salt. The salt is then carefully dried and, from sea to tube, the whole process takes about ten days. Effectively, the product is handmade, with individual salt makers tasting and signing off each tube (look out for their initials on the bottom!) and, whilst some sea salt manufacturers might produce about three tonnes a day, they only make about 110-140 kilos of Halen Môn, which explains why it comes at a price (250g costs around £4.25). So what’s their recipe for success? Well, take two passionate and hard-working people and come up with a great product. From the very beginning, they have strived to be a quality-oriented business and all their efforts seem to have paid off. It is the texture of the flakes that chefs seem to appreciate the most, as it can be sprinkled rather than ground over food. The fact it is additive free means people are willing to pay a premium and, let’s face it, it looks pretty good in your kitchen! Mix in some skilful marketing (the packaging alone makes you want to buy it) and a few celebrity endorsements (10 seconds of use by Clarissa Dickson Wright on Two Fat Ladies seemed to do the trick). And then – as must all businesses – keep on stirring! 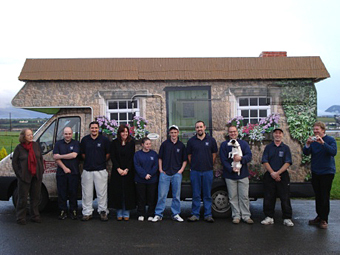 Anglesey Sea Salt Company, Brynsiecyn, Isle of Anglesey, LL61 6TQ. Keep an eye on the Menai Strait weather by checking out their webcam!